Study shows link between the tau component of Alzheimer’s and cholesterol. It has been known for some years that Alzheimer’s disease is characterised by two types of lesions, amyloid plaques and degenerated tau protein. The amyloid component and altered cholesterol metabolism are closely linked, however, the relationship between Tau pathology and cholesterol is currently unclear. Now, a study from researchers at Inserm, University of Lille and the University of Paris-Sud have shown in a rodent model that overexpressing an enzyme that can eliminate excess cholesterol from the brain may have a beneficial action on the tau component of the disease, and completely correct it. The team state that this is the first time that a direct relationship has been shown between the tau component of Alzheimer’s disease and cholesterol. The study is published in the journal Human Molecular Genetics. Previous studies show that excess brain cholesterol cannot freely cross the blood-brain barrier; to be eliminated it must be converted into 24-hydroxycholesterol (24-OHC) by the enzyme CYP46A1 (cholesterol-24-hydroxylase). Earlier studies from the group demonstrated the key role of cholesterol in the disease. Leading on from this, the lab hypothesized that increasing the efflux of cholesterol from the brain by overexpressing CYP46A1 might have a beneficial effect on the elements of Alzheimer pathology. 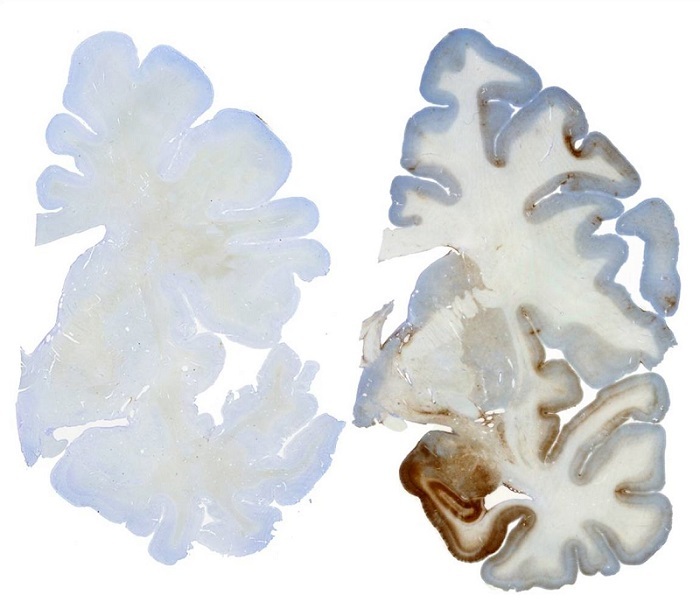 In the current study a viral vector, AAV-CYP46A1, was observed to be effective in correcting a mouse model of amyloid pathology of the disease, the APP23 mouse; which would suggest that CYP46A1 is a viable target for Alzheimer’s disease. Conversely, results show that in vivo inhibition of CYP46A1 in the mice induces an increase in the production of Aß peptides, abnormal tau protein, neuronal death and hippocampal atrophy, leading to memory problems. Data findings show that together these elements reproduce a phenotype mimicking Alzheimer’s disease. The team surmise that the results of the current study suggest a gene therapy approach for Alzheimer’s disease using an intracerebral administration of a vector, AAV-CYP46A1, in patients with early and severe forms for whom there is no available treatment. To achieve this objective the lab are now carrying out all the preclinical steps of development in order to submit an application for authorisation of a clinical trial. Stained whole brain section with immuno- staining for tau protein. Note the preferred deposition in the mesial temporal lobe structures. AANS Neurosurgeon 2011.